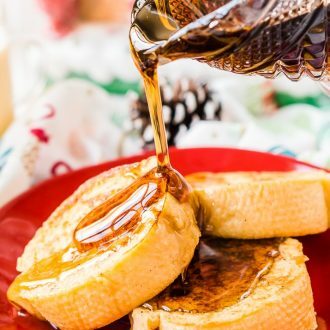 This Eggnog French Toast is dipped in a mixture of eggnog, eggs, rum, vanilla, and nutmeg before it’s cooked to perfection and slathered in syrup for a delicious holiday breakfast! 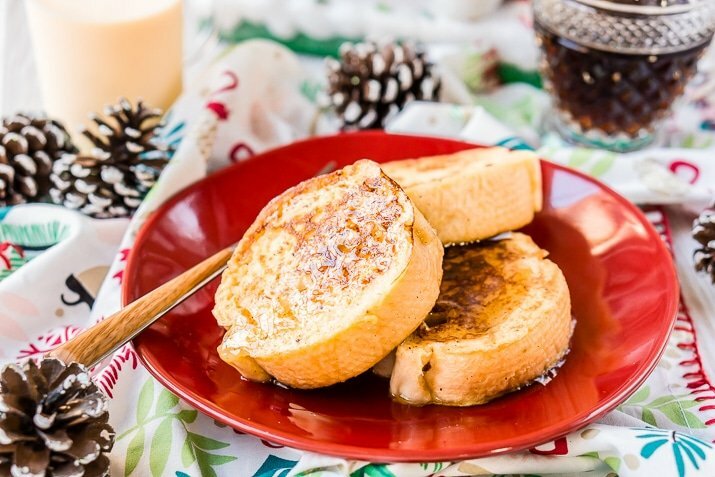 This eggnog french toast is a simple and festive way to kick off Christmas morning or any winter weekend! I wasn’t a big fan of eggnog until my first holiday season working at Starbucks. My fellow Baristas and I were always concocting new drinks and my all-time favorite is Eggnog Creme with Gingerbread Syrup. Over the last five years, it’s become a holiday staple and the season doesn’t officially start for me until I have one. Since I love that drink so much, I’ve been adventuring more and more into the land of nog. Seriously though, if you don’t like eggnog, try it steamed, so much more amazing than drinking it cold! Plus, I really do love using it as an ingredient in my holiday recipes, this Eggnog Cheesecake is one of my favorite Christmas desserts and this Eggnog French Toast is perfect for chilly mornings! 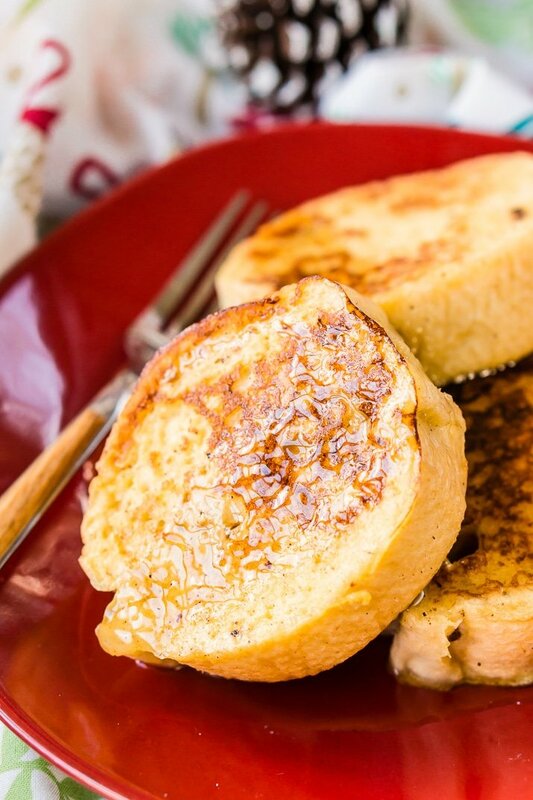 How many of you grew up on French toast? When I was a kid, my Nana made it for us a lot. It was usually a blend of eggs, milk, vanilla, and cinnamon coating slices of white bread that had been cooked on the griddle until golden brown. Well, this holiday breakfast uses the same process but mixes those ingredients up a bit. It’s a simple concept, replace the milk in your egg wash with creamy eggnog and the holidays are on full blast! Add a splash of rum or rum extract for an extra boost of holiday spirit, oh and don’t forget that nutmeg, it’s essential to get the full holiday vibe! Also, while you can use regular ole’ white bread, try it out with French bread! Instead of over saturated and eggy pieces, your Eggnog French Toast will be light and fluffy on the inside with a deliciously caramelized exterior. This dish tastes like Christmas morning feels, the flavors are an amazing combination and the french toast’s aroma is crazy good. Nog, nutmeg, and sugar… what’s not to love, right? It’s easy enough to make and would make a great addition to a Christmas brunch! You can serve it topped with butter and maple or gingerbread syrup! More Holiday Breakfast Recipes You’ll Love! Pin This Eggnog French Toast for Later! Watch How to Make Eggnog French Toast Below! This post was originally published November 10, 2013, and was updated October 29, 2017. 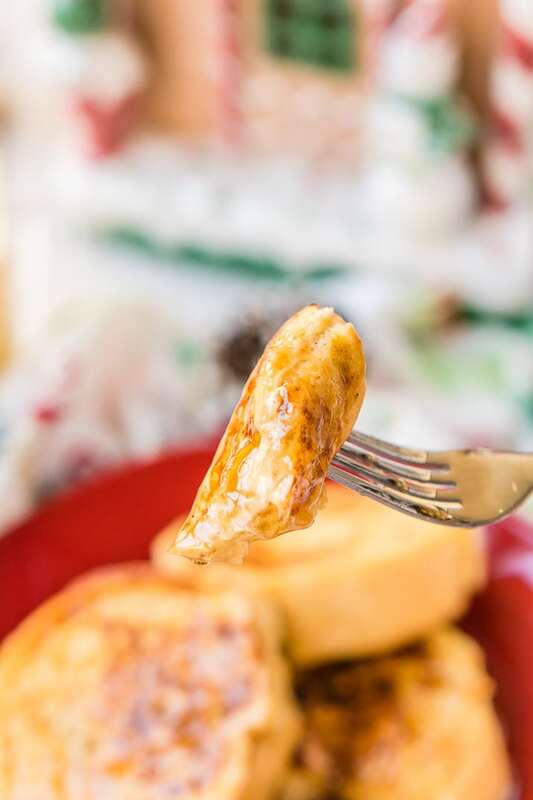 This Eggnog French Toast is loaded with holiday flavor! A fluffy French bread dipped in eggnog, eggs, vanilla, and rum for a delicious holiday breakfast! Cut french bread into 1-inch thick slices. Wisk together eggs, eggnog, vanilla extract, rum, and nutmeg. In a large skillet, melt butter over medium heat or use non-stick cooking spray. Dip each side of your slices in the eggnog mixture and put them in the pan. Cook each side until golden brown, about 2 minutes on each side. Add butter or cooking spray to the pan as needed for cooking. Plate and top with butter and syrup. Nutrition Facts are an estimate per slice. where did you buy the gingerbread syurp? You can get it right at http://www.stonewallkitchen.com. 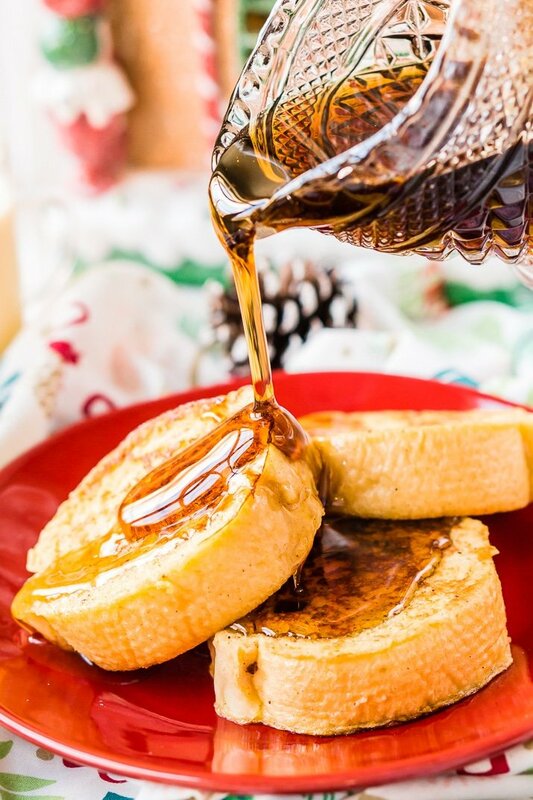 These eggnog french toasts are so Instagrammable and adorable! It is very decadent, and the people in my office are happy today! Thx for sharing recipe. Can i post it on my blog? I prefer healthy food! And I’ll definitely try these eggnog french toasts. My husband would love it! Thanks for sharing! So glad they all loved it!